Except for the harried schedule we usually ascribe to when overseas. I think both of us needed an ‘anti-schedule’ kind of trip this time. We weren’t even in the turning lane and I looked over at Andrew, and he looked back at me. He threw the car into reverse, switched lanes and turned in. There is just something about our trips; I all of a sudden feel spontaneous and we’re such foodies that ANYTHING that looks intriguing is fair game. 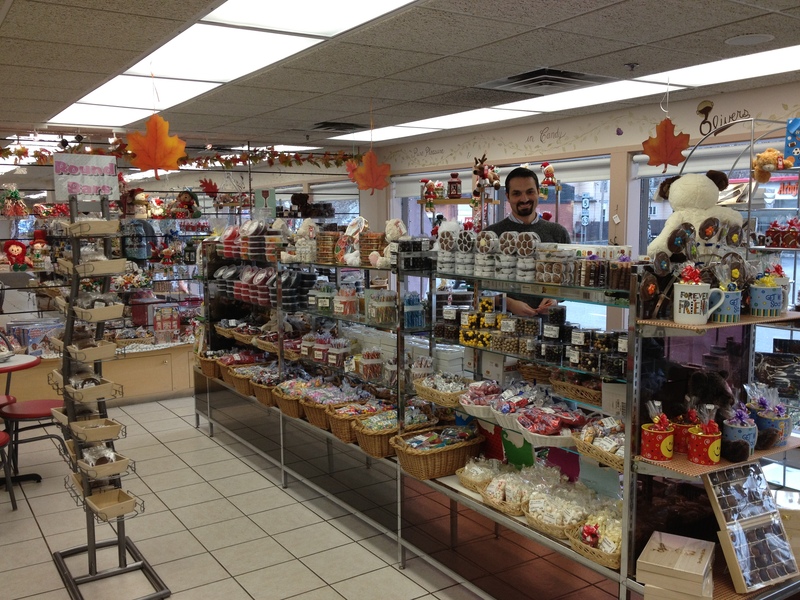 A random, old-school, obviously well-known chocolate shop? You bet. 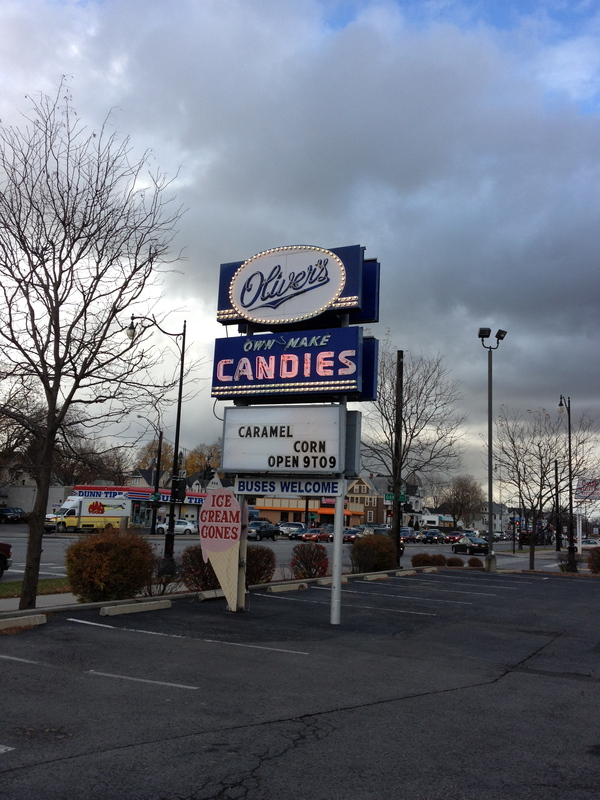 Initially the ‘cashew glaze’ caught my attention, but we ended up leaving with a pumpkin pie sundae with hot fudge for me and bag of goodies for the car. Andrew chose some flavored candy sticks, white chocolate-covered pretzels and caramel corn; I threw some white chocolate-covered oreos and a small container of glazed cashews. 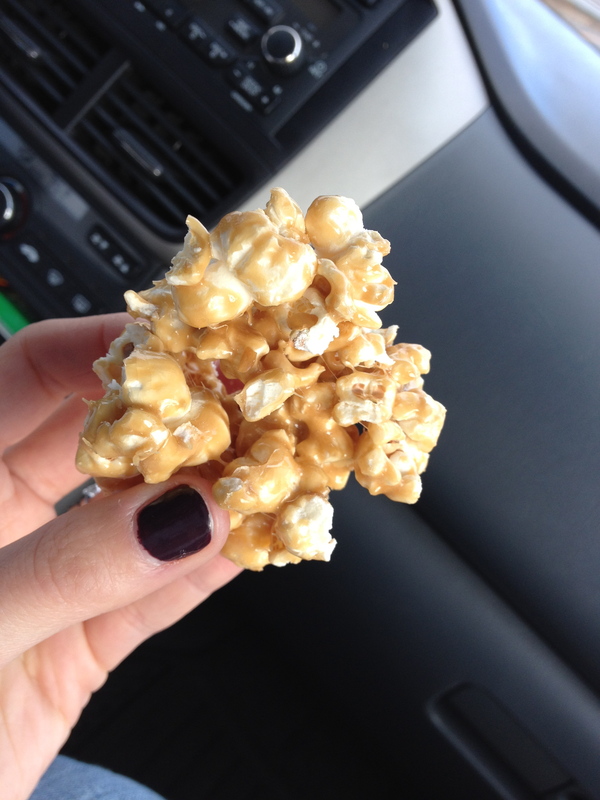 We broke into the caramel corn in the car and it was quite covered in caramel. I’m not a huge fan myself, but it’s definitely one of Andrew’s weaknesses. 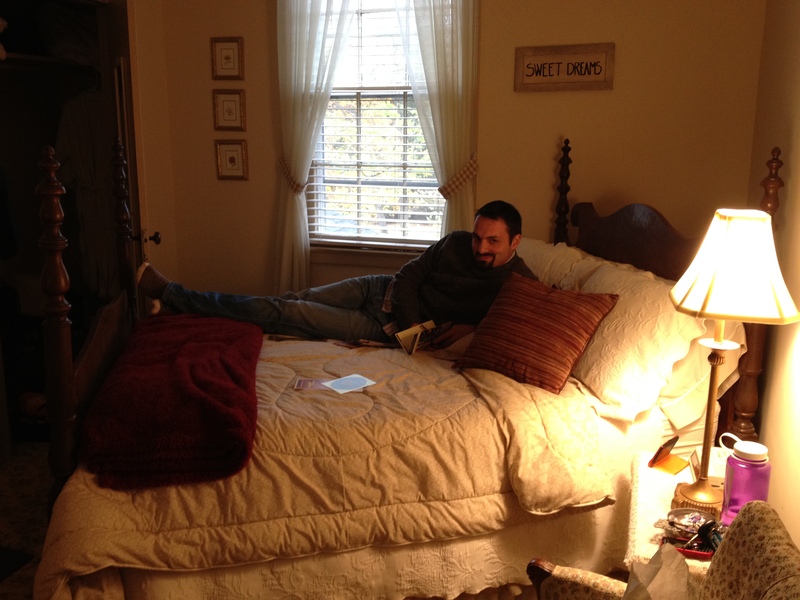 We arrived at the Oliver Phelps Bed & Breakfast just after 3 p.m. and were shown to our room. I opted for the cheapest room, which doesn’t actually have a bath connected to the room (it’s just outside the door), figuring the money we saved would cover a dinner out or something. They have WiFi (sweet!) and while we could have rushed around and find something to do, we ended up lying in bed watching the news and falling in and out of pseudo-sleep until almost 5 p.m., when we got ready for dinner. We knew we were going to Eric’s Office for dinner (I’d scoped-out restaurants beforehand) and when we saw it was only .8 miles from our b&b, I decided we should walk. I’ll admit, it was a bit chilly (and seemed WAY longer than less than a mile) but in the end I’m glad we did. The walk back wasn’t quite so bad. Eric’s Office is a local bar/restaurant with a teeny-tiny dining area, which is why we went to dinner so early. 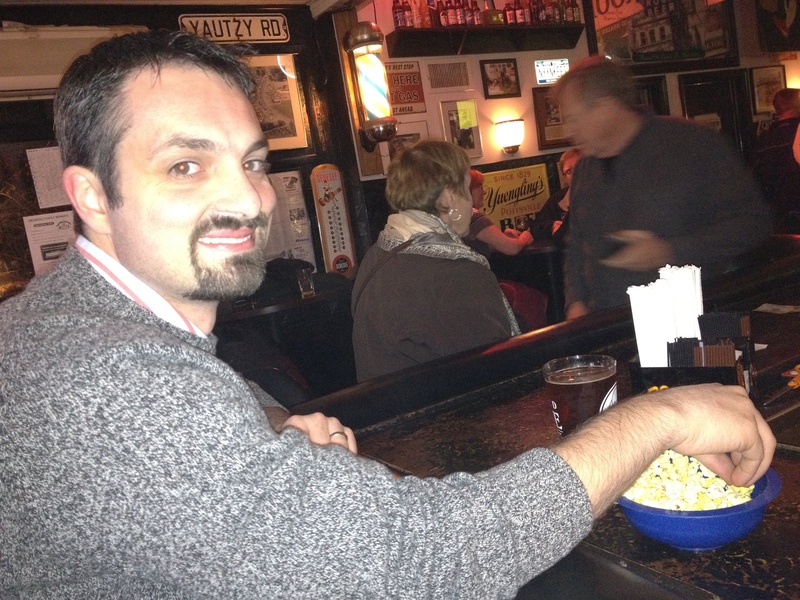 While we waiting for a table, we sat at the bar with some beers and popcorn (dangerous! we had THREE bowls of it!) and watched ESPN…with everything going on at our alma mater, PSU, we’re pretty keen on catching as much news as we can. 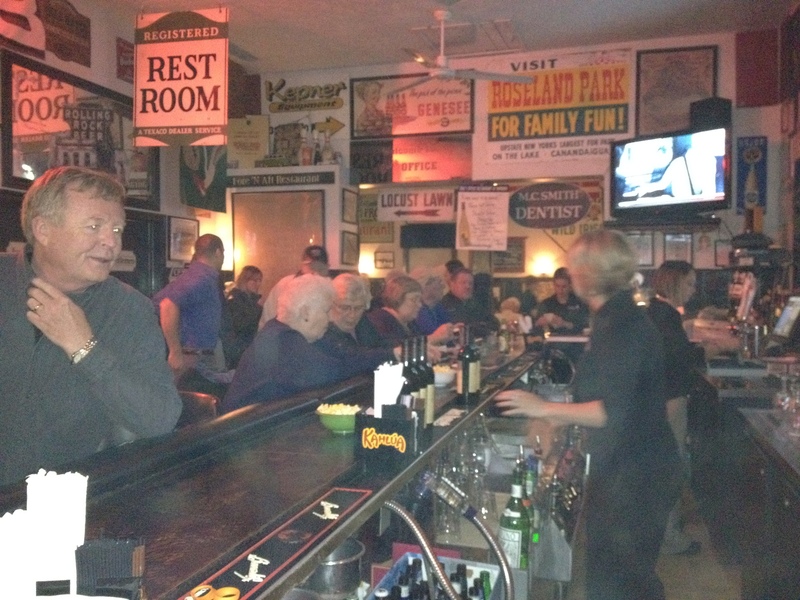 We loved the atmosphere at Eric’s and it was a clear local favorite, pretty much a prerequisite of ours when choosing where to eat when on trips. Andrew ordered a pork tenderloin with a root-beer reduction, and I got beef tips and mushrooms in gravy served over blue cheese mashed potatoes, covered with crispy onions. It was a bit heavy, but the flavor was amazing. The atmosphere was really the best part; it was casual but not too casual. After a crisp walk home, we snuggled in bed with come Dexter episodes before turning out the lights. I had thought about running in the morning, but decided I needed sleep more than exercise after the week I’ve had. Unfortunately, I didn’t get as restful a night of sleep as I would have liked (the bed is a double and not a queen, and it’s always hard for me to sleep in new places), but I made it until 7:15 a.m., which is a good three hours more than all last week. 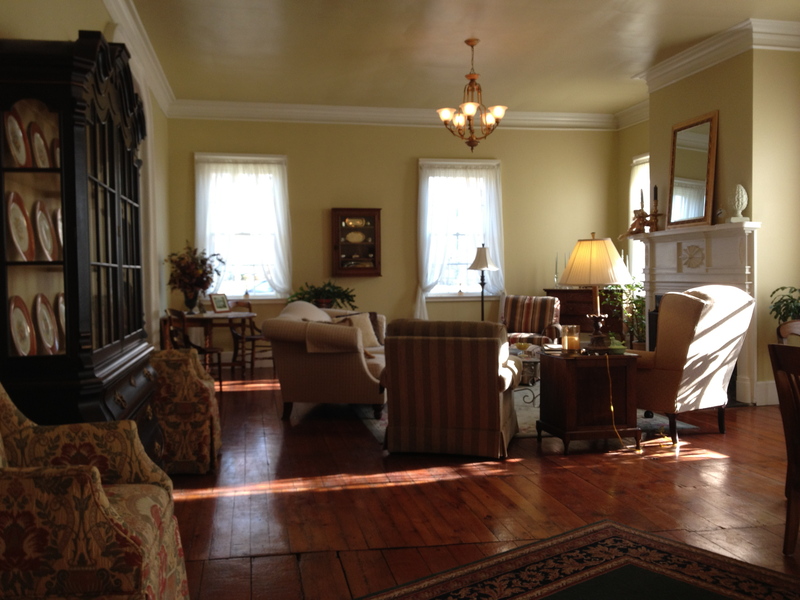 We headed down to breakfast by 9:30 in the high-ceilinged breakfast room of the b&b. 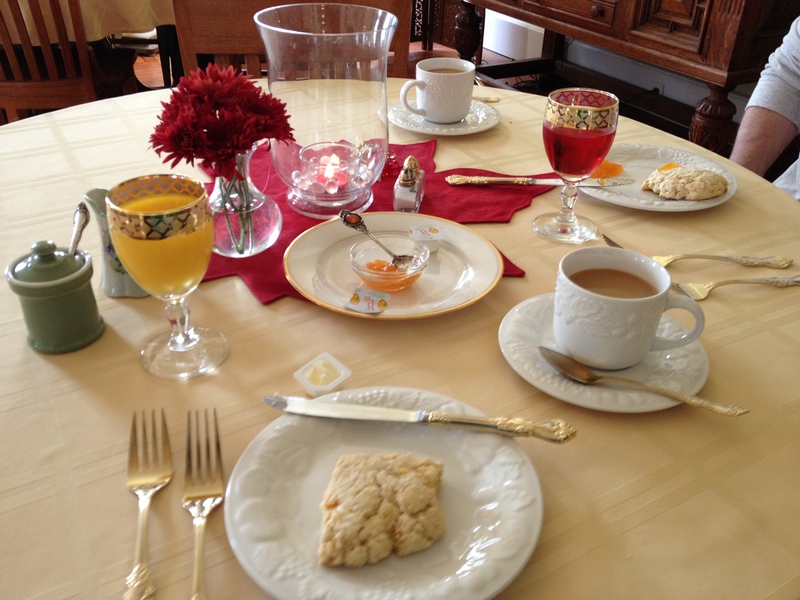 We were brought apricot walnut scones, coffee and juice to start. While a little sweet for me, the scones were a fantastic way to begin. 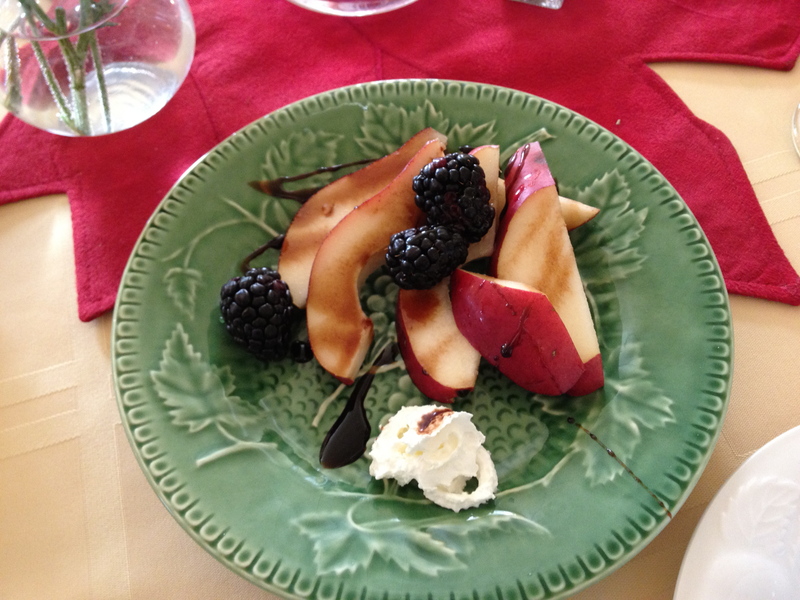 Next, a fruit plate of pears and blackberries drizzled with a cinnamon-balsamic reduction. Yum. 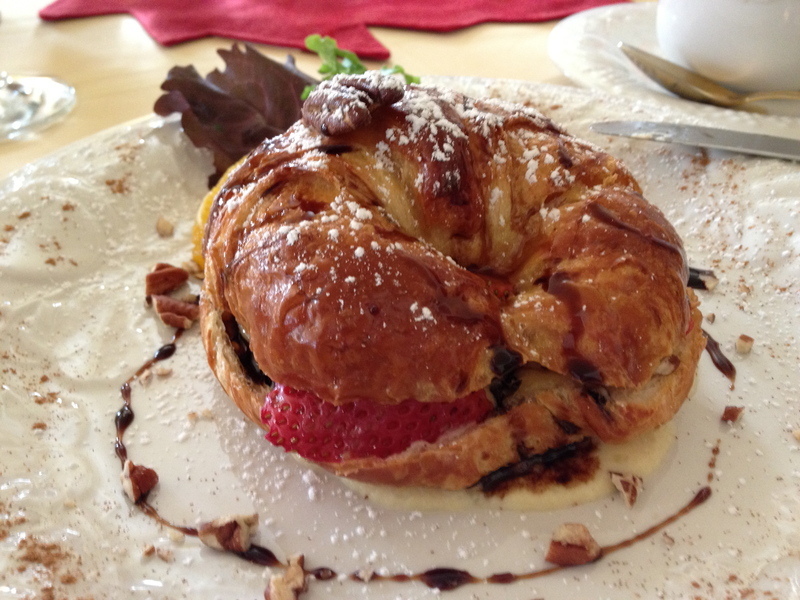 And the coup de grace: a strawberry/lemon/mascarpone mix sandwiched in a croissant, drizzled with a strawberry-balsamic reduction. The reviews online of this place all raved about the breakfasts; now I know why! We’re headed out today to walk around the main ‘downtown’ area, visiting some shops and things, as well as the Christkindl Market, which is just across the street. Must walk off breakfast! Posted on November 12, 2011 February 27, 2016 by thehealthypineapplePosted in TravelTagged breakfast, chocolate, Pumpkin, vacation. You guys deserved this get away! I would have loved the breakfast they served as well. I am so glad you had such a good time with Andrew. Now back to a full week of work and school….